Size 6 - $33.99 Only 1 left! Size 7 - $33.99 Size 8 - $33.99 Size 10 - $33.99 Only 1 left! Okay cats, pop quiz time, and listen up because this could keep you from looking like a square some day! You may be the hippest in the bunch, who can out-dance anyone at the sock hop, has a perfect poodle skirt for every occasion, and can rock a pair of feline-framed glasses like no other. But do you know what kind of shoes to wear with your cool 50's style while you're twistin' the night away? 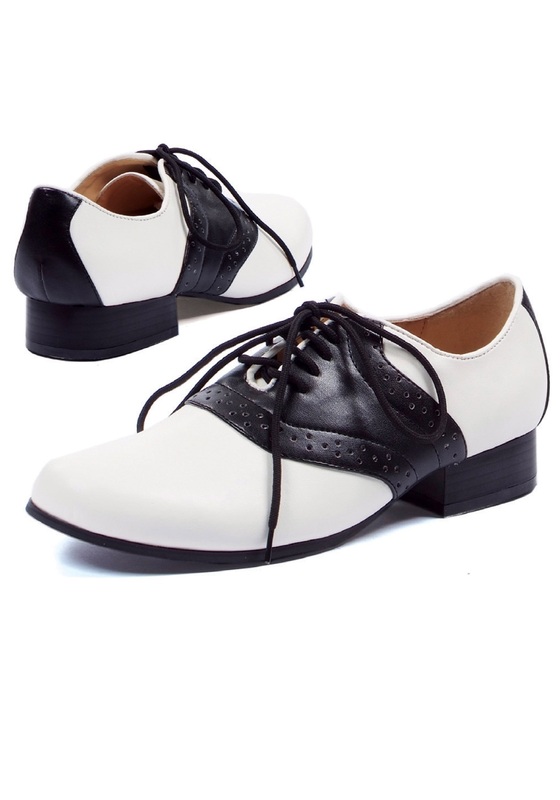 The answer is these swell 50's Saddle Shoes, of course! These boss faux leather shoes are modeled after the trendy footwear that were all the rage with gals in the 1950's, and are exactly what you need to finish off your hip vintage costume. Whether you're going for a preppy straight laced look or more of a sassy baby doll vibe, these retro shoes will keep you from ending up on the train to Squaresville!